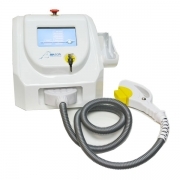 Intense Pulsed Light (IPL) Hair removal,Skin rejuvenation,Vascular treatment,pigmentation. Intense Pulsed Light (IPL) is a kind of high-intensity source of broadband coherent light These properties allow IPL to have wide application for ablative resurfacing therapy, which is based on the theory of selective absorption of human skin tissue and photo thermolysis light sources. Meanwhile, IPL photo rejuvenation technology is more efficient and offer patients less downtime than conventional therapies for an aged and photodamaged skin. IPL systems work on the same principles as lasers in that light energy is absorbed into particular target cells with color (chromophores) in the skin. having a wavelength range of 500 nm- at 1200 nm. The light energy is converted to heat energy, which causes a specific result to the target area. IPL systems are different to lasers in that they deliver many wavelengths (or colors) in each pulse of light instead of just one wavelength. 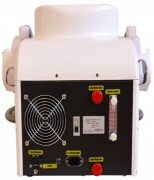 Most IPL systems use filters to refine the energy output for the treatment of certain areas. This enhances penetration without using excessive energy levels and enables targetting of specific chromophores (these are skin components that absorb light). 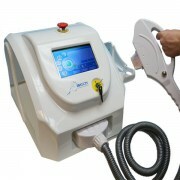 IPL therapy is considered a non-ablative resurfacing technique, which means that it targets the lower layers of skin (dermis) without affecting the top layers of skin (epidermis). The advantage of IPL therapy is its minimal downtime – patient can often have the procedure done on their lunch break and return to work immediately afterward. For the treatment of unwanted hair. Light pulses targeted at the hair follicle causing the hair to fall out and prevent further growth. Generally ineffective for light colored hair. May be used for hair in any location including underarms, bikini line, face, neck, back, chest and legs. For the treatment of spider and thread veins, and some vascular birthmarks. Light pulses targeted at the red-pigment (hemoglobin) in the blood which heats and destroys the pigment without affecting the skin or other tissues. For the treatment of age spots, freckles, flat pigmented birthmarks and other skin discoloration problems such as melasma / chloasma and erythromelanosis of the neck (poikiloderma of Civatte). Treatment sessions usually last about 20 minutes. A course of 4-6 sessions every 3-6 weeks may be needed to achieve desired results. Most patients can return to work immediately after treatment. Note: The operator, Doctor, or esthetician has to have a license and specific IPL training from an accredited source, is not the responsibility of the company that sold them the machine.